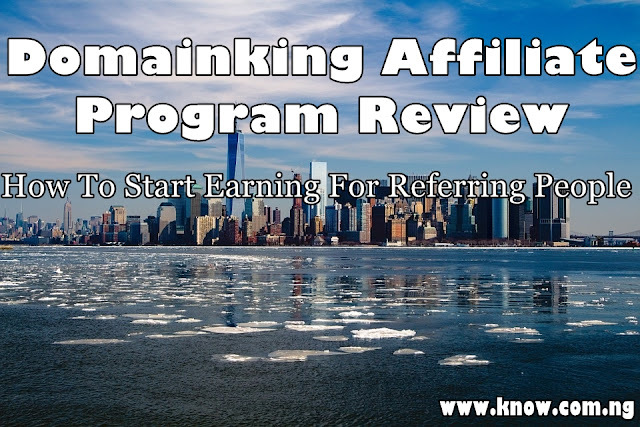 Affiliate Marketing Reviews Domainking Affiliate Program Review | Can I Really Make Good Money From Them? Domainking Affiliate Program Review | Can I Really Make Good Money From Them? The Domainking affiliate program is another legitimate way of making money online by promoting Domainking services. Domainking is a popular web hosting company in Nigeria and they provide services like sales of domains, blog, website, VPS, Wordpress hosting. It is a good way of earning as a blogger because all you need to do is to refer new customers to them. Unlike the WhoGoHost affiliate program, they pay once your earnings reach ₦1,000 and straight to your local bank account. However, they also pay you based on a percentage of sales made via your unique referral code. It is also worth knowing that they only pay affiliates when their referrals purchase hosting plans, and don't pay for sign-ups. In order to become a Domainking affiliate, you'll first need to create an account with Domainking.NG because they don't have a direct link. Registration as a new customer is very easy, just visit Domainking.ng and fill in your details. How To Join The DomainKing Affiliate Program Without Being A DomainKing.NG Customer? What if you've not purchased any of the services offered by DomainKing.NG before? You can still become an affiliate and it's still free to join. Just follow the following steps"
In conclusion, the Domainking affiliate program is a way of making some extra money by promoting hosting services. You can also apply these five tips for generating affiliate sales and I'm sure it'll be of great help to you. Like we earlier said, you need to reach a minimum of ₦1,000 to be able to cash out and they pay to your local bank account. You can request for your payment in your affiliate dashboard or raise a support ticket. You'll also need to submit an identity proof, an address proof and your bank account details before you can be able to receive payments.